Can Elements pull the load for Final Cut Pro? There is an old saying that goes something like this. "Final Cut Pro has the best Text generator around, its called Photoshop." Since Final Cut Pro 3 now includes Boris Calligraphy Text Generators: 'Title 3D' and 'Title Crawl' this saying has lost some of its meaning. However, there are still many situations that call for prepping art in Photoshop for import into FCP. In particular, the sizing and preparation of photos for the conversion from square pixels used by computers to rectangular pixels used by video. Additionally the use of Layers for the creation of text, logos and art for import into FCP. With a price tag of $ 609, Photoshop 7 is a large investment. 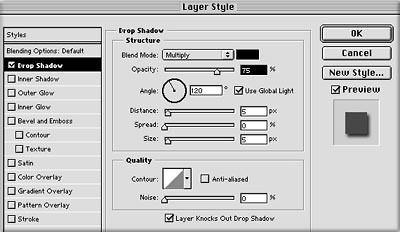 In the past Adobe has released several different variations of Photoshop LE. These early versions of a less expensive Photoshopesque type application seemed to be lacking and were not well received. 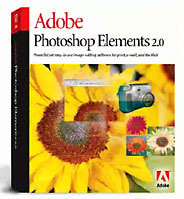 Adobe then introduced its latest effort called Photoshop Elements at $ 99. This time they got it right. The version 2 upgrade adds a few new 'auto' features but also adds OS X native support. Unofficially Elements 2 will run on OS 10.2.1. Photoshop Elements 2 is Photoshop 7. Photoshop 7 with the more professional features removed. It still offers the main features of PS 7 and the interface is virtually the same. Listed below are the feature not found in Elements 2. While Adobe did remove the advanced feature from Photoshop Elements 2 there are a few improvements and some new powerful features aimed at providing help to the beginner. There is also one change that I wish that Photoshop 7 had. The menu bar in Elements 2 is better organized and more functional than the menu bar in Photoshop 7. Because of the length of the Elements 2 menu bar I have cut it in half for display purposes. 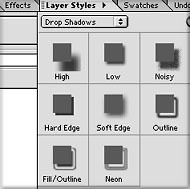 The first thing that you will notice is that there are two rows in the Elements 2 menu bar as opposed to the single row in the Photoshop 7 menu bar. The top row, called the 'Shortcuts' bar, provides access to Common commands. The items that have been added to the Shortcuts bar are are available in PS 7 from the drop down menus. There is a search engine built into the menu bar, a nice feature. What is new and what I really like about the Photoshop Elements 2 menu bar is a tabbed section called the 'Palette Well', shown below. Clicking on any one of these tabs will drop down the appropriate palette, click on any other tab or return to your art work and the palette closes. This is great for quick access. If you need to have the palette open you can simply pull the tab away from the menu bar and the palette can be positioned and left open on your screen. Close the palette window and it returns to the Palette Well. Effects and Filter tabs when pulled away from the Palette Well, open to palettes that show all 90 effects and filters in either large thumbnails or in list view. The Effects tab offers a number of fixed presets; Image Effects, Text Effects, Frames, and Textures. There are no controls for these effects. 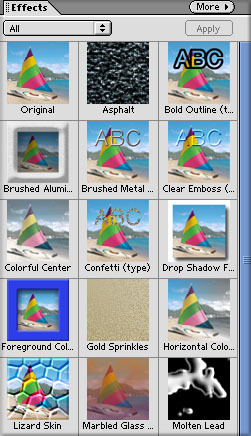 The filters in Elements 2 are identical to, work in the same manner and offer the same controls, as those found in PS 7. 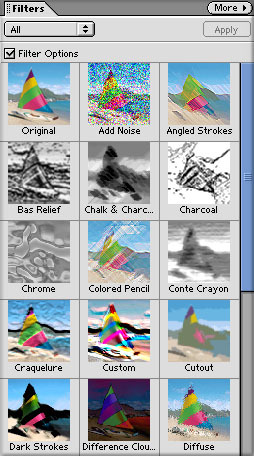 Layer Styles There are some differences between Photoshop 7 and Elements 2. Both applications have a Styles palette which offer one click styles, with no controls. In addition to the fixed or preset Styles, Elements 2 provides Styles, like drop shadow, that offer several choices or looks. If you apply a style and then double click the layer styles icon for that layer in the layers palette, it will open a pop-up window giving you a chance to adjust some elements of that style. 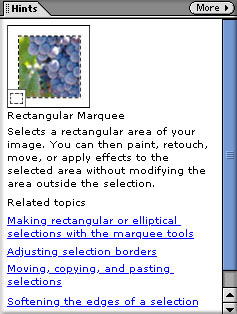 Photoshop 7 offers more complete control over these same Styles, as shown below, with Drop Shadow. Tool bar in Elements 2 is also different from the one in PS 7. Missing from the bottom of the Elements 2 Tool bar are the Quick Mask mode and the three screen Display modes. A few of the tools are different and of course Adobe rearranged the position of the tools in the Tool bar just to keep things interesting. Go figure. 'How To' and 'Hints' tabs (palettes) are only found in Photoshop Elements 2. These two palettes help the beginner work and learn the program. Placing the cursor over any tool in the Tool bar will activate the 'Hints' palette with information about the selected tool and links to additional information. The 'How To' palette provides step by step instructions. When the Search engine in the menu bar is used, Internet Explorer is launched which runs the Elements 2 'Help' program. Enhance Menu is a blend of Photoshop 7 and Elements 2. Found only in Elements 2 are three 'Auto' commands; Levels, Contrast and Color Correction. These are one click automatic corrections made by Elements 2. Adjust Lighting is also unique to Elements 2, with Adjust Backlighting and Fill flash which have controls. 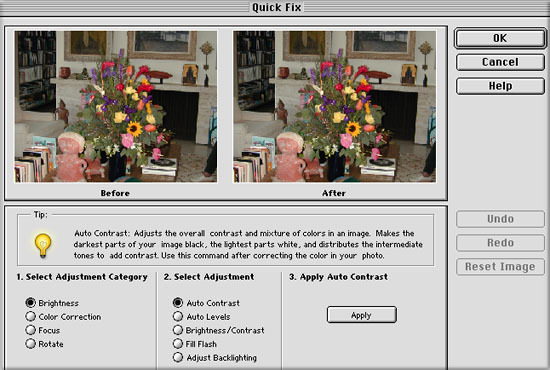 Adjust color has some standard Photoshop 7 adjustments, like Huge saturation and Variations but also has; Color Cast, Remove color and Replace color. Adjust Brightness/Contrast is the same as in Photoshop 7. Quick Fix is a feature found only in Elements 2. With just a couple of clicks of the mouse you can correct and enhance the color, contrast, focus and the rotation of a picture. Under each of these selections you have various options to get the photograph the way you want it. If you just want to work on contrast, color, lighting, brightness and contrast use the Enhance tab to select each individually. 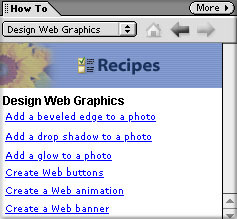 Additional Features Elements 2 offers a number of features such as the ability to import photos directly from digital cameras, a number of auto correction tools for photos, creation of PDF slide shows, Multiple-image layouts and auto conversion of photos for the web and e mail distribution. 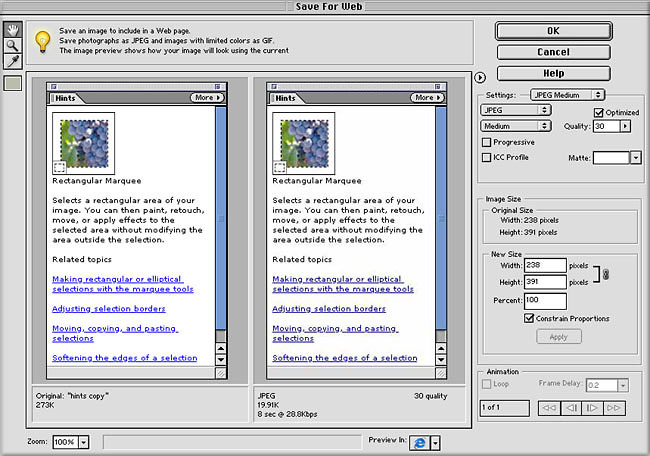 The 'Save for Web' command opens a two up display, showing the original image and the image as it would look after you have applied your compression choices. Each time you change a compression setting, the new version will be updated. Standard web compression formats are available and you can resize the original. The file size of the image both before and after compression is noted. The Photoshop 7 version of 'Save for Web' offers a few more features including a four up display, showing four different compression levels at the same time. Photoshop Elements 2 looks and runs exactly like Photoshop 7. It is Photoshop 7. Some features left out and others added. All the menus are the same and aside from the absence of the advanced features mentioned above everything else is there including the great 'File Browser'. Elements 2 will accept all PS and third party plugins. Those features need to prep text and art for FCP are available and work the same as PS 7. So, to answer my own question, "Can Photoshop Elements 2 pull the load for Final Cut Pro? ", the answer is yes. Considering that Photoshop Elements 2 is 'Photoshop' with most of its features and costs $ 99, its the best deal I've seen in a long time.